and you’ll find a rich vein of old English village names. Piddletrenthide.Piddlehinton.Puddletown. Puddletown Forest. Briantspuddle. Ryme Intrinseca. Fancy having that on your address. We spent last weekend in the Dorchester area soaking up some Thomas Hardy country. Dorset is a green and pleasant land at this time of year. The county looks lovely and Hardy would have been proud of his home town. 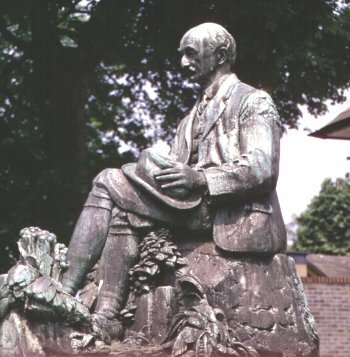 Dorchester is the basis for his “Casterbridge”, from which the Mayor hailed. The narrow country roads are riddled with holes but thankfully very quiet. Getting lost in them is the way to get some eye-candy if you are heavily into historical landscapes. Fields roll into ancient terraces. Hedges lead to enchanting copses (or is it copsii ?). And that forest in the valley looks dark and mysterious and so crying out to be explored. Of course, not far from here is Cerne Abass where once our ancient ancestors thought it would be a lark to carve a rampant giant into the hillside. They were a rum lot, and no mistake. 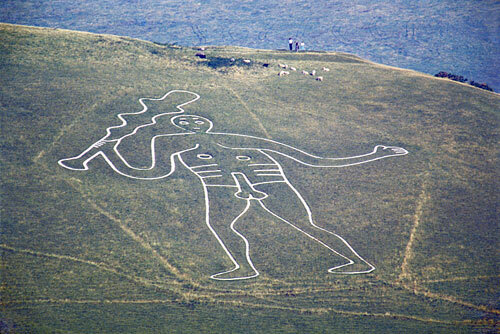 There are special viewing places from which to admire the fertility symbol. One can only imagine the pagan dance that took place here, if any did. Nuff said. 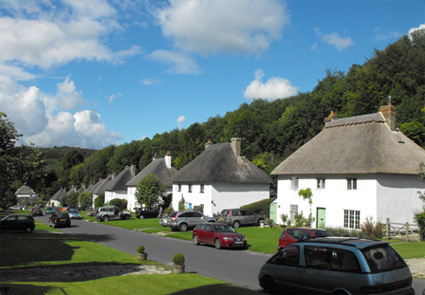 But one of the main treats around this part of Dorset is to be found at Milton Abbas. Here you will find a good potted English history taking place in one way or another. Class distinction; oppression of the poor; Capability Brown; early forays into the European market; eccentricity. And so Milton Abbas is now one of the loveliest villages you could hope to come across. 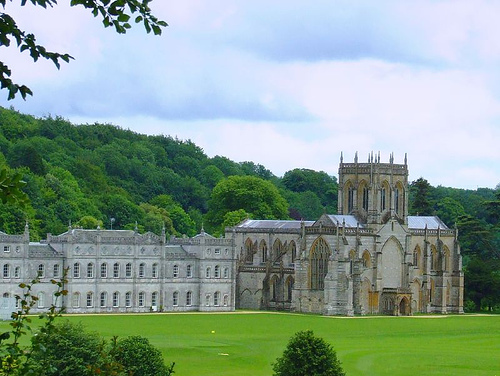 The Abbey and Mansion are now a private school. The well-healed send their progeny to the school whilst driving passed the oiks who still take tea and cakes in the street in Milton Abbas (and damned fine cake and tea it is too). half of the deal in the end. If you are down that way check it out. And whilst we are on the subject (as if we were) wouldn’t it have been great to have locked up the Expenses Busting MP’s in the stocks and thrown rotten fruit at them. Ah, sweet . I think it is a punishment we should bring back. Go on – who would you put in the stocks ? Next postThe sniffing of rats. Look how green that grass in the third picture is?? Awesome! It cannot be so, can it? But it is an incredibly green cricket pitch. The 18th-century fair sounds like a good time! Sure does. Unfortunately we won’t make it. As for the stocks… I think I’d like to put members of the Tea Party in there. They’re not only misguided, they’re embarrassing! Puddles and Piddles….hahaha….this reminds me of PG Wodehouse!